A group of young rockers from a small town has their first performance. They have to drive through the ominous state of Nevada. After 16 hours of travelling the group of friends is pretty tired, and they are looking for a place to sleep, a market to buy some food, and a gas station. Fatty Mike looks at a map and finds a suitable place not far away... 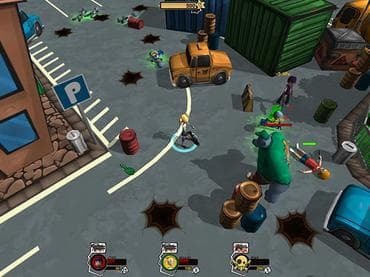 If you like game like Zombie Shooter, Alien Shooter, Alien Shooter 2, Fallout Tactics, All Zombies Must Die, Zombie Raiders, Walking Dead, this game is for you. Download free full version games, enjoy great looking 3D graphics and have fun. Free Game features: - Incredible team action; - Improve weapon and your team; - Easy to play, lot of fun and absolutely free game. If you have questions about Hot Zomb: Zombie Survival game, please contact us using this form.